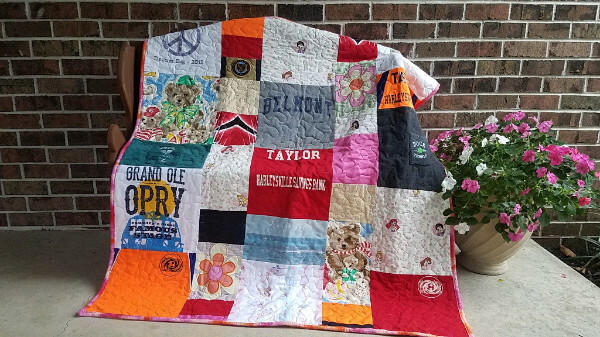 Each of these items has made the quilt become that much more memorable and personal. Currently I have 17 quilts on my schedule. 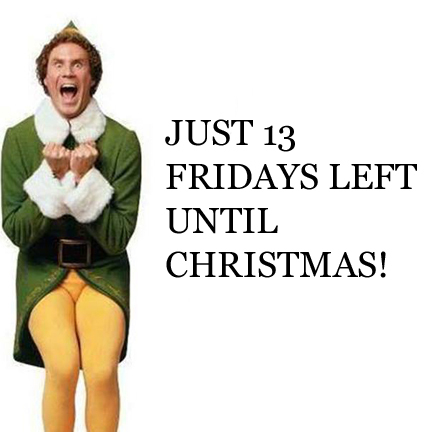 Many are for the holidays! 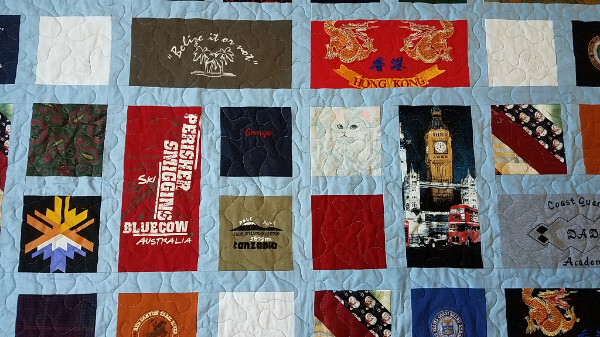 If you are interested in a Memory Quilt for the holidays, or for any occasion, NOW is the time to order! My business continues to grow and so does my Facebook page! I now have 743 fans.Thank you all so very much for your support! 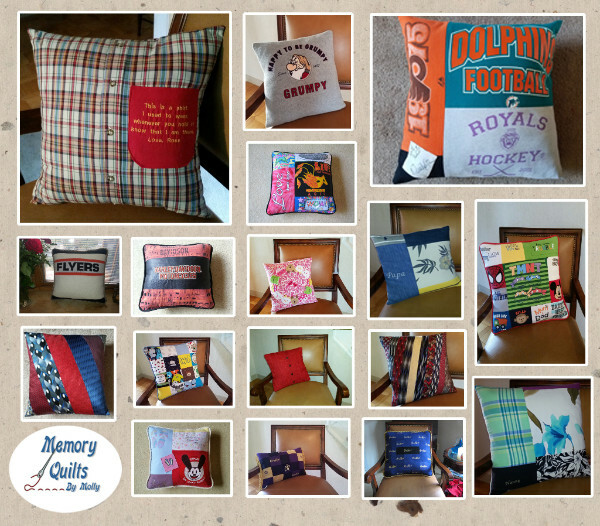 Memory Pillows make wonderful holiday gifts! They truly are a very personal and very thoughtful gift. Pillows come in 3 styles and sizes! Turnaround time is 2 weeks plus shipping time. Last year over 60 pillows were made! Learn more here. 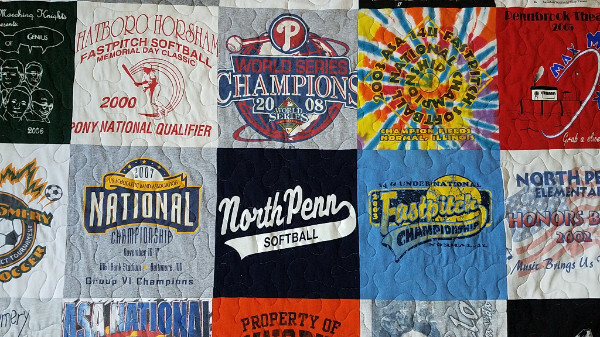 Check out these two beautiful Basic style quilts: See the field hockey, softball, theater, band, and other shirts that makes these quilts so meaningful! 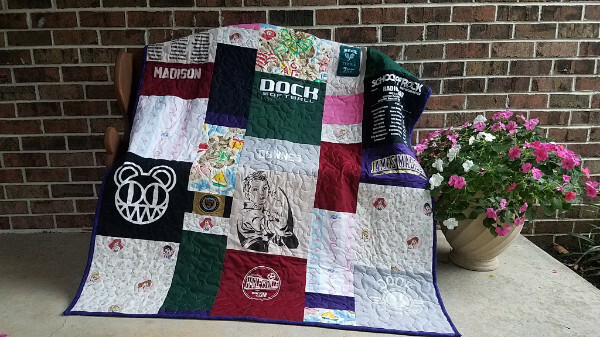 Gotta love the unique story each quilt tells! . There is no such thing as too much color in these quilts! This lucky lady got to play collegiate softball. Her college softball shirts were added to tell the full story! The Modern style quilt shown above and below continue to be very popular. 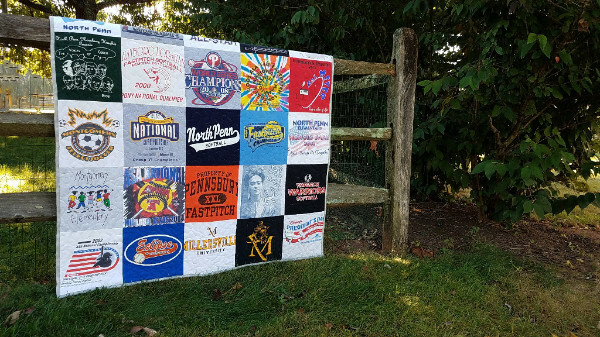 This style is perfect for shirts that have both large and small graphics.Learn more about it and the other five styles of quilts that MQBM makes. This gorgeous Modern style lap quilt is so bright and colorful! So many bright shirts, curtains and even sheets were used! These quilts are proof that colors make these quilts. The Block style quilt shown is one of my favorites! There is a lot of labor involved but the end result is well worth it. This style was created for garments other than t-shirts. 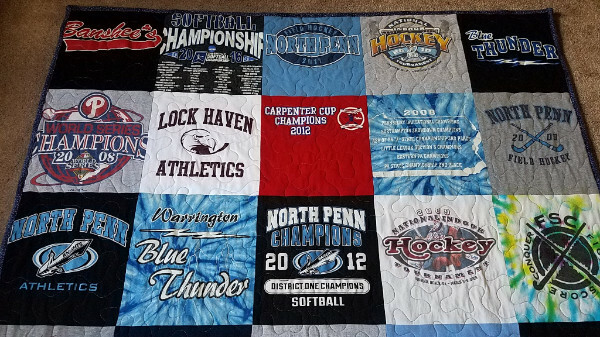 But this particular quilt has many t-shirts included. All have small logos that fit perfectly! The shirts that were provided for this Block style lap quilt were perfect! All graphics on the shirts were small enough to fit in the small rectangular and small square blocks that make up this quilt. This style was perfect for the shirts that were provided. The Staggered style large lap quilt shown below always turns out nice. This quilt was made in honor of an Irishman. As a result a true green was selected for the sashing. Embroidery really personalizes each quilt. 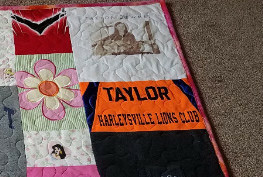 Many Memorial quilts become that much more meaningful when names or sweet sentiments are added. The name Pat was added to this quilt. Continue to be popular! 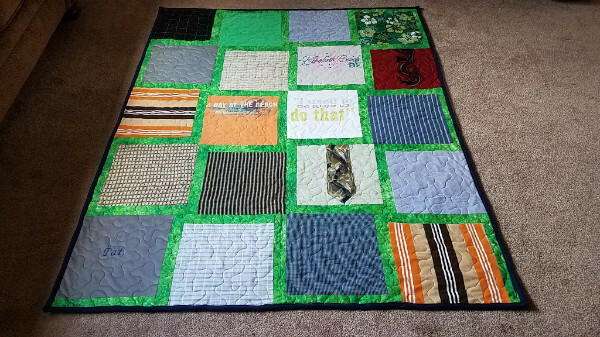 This lap quilt below is a variation of the Diagonal style Baby quilt. We decided to sprinkle the shirts throughout instead of making the diagonal pattern. The end result-beautiful! 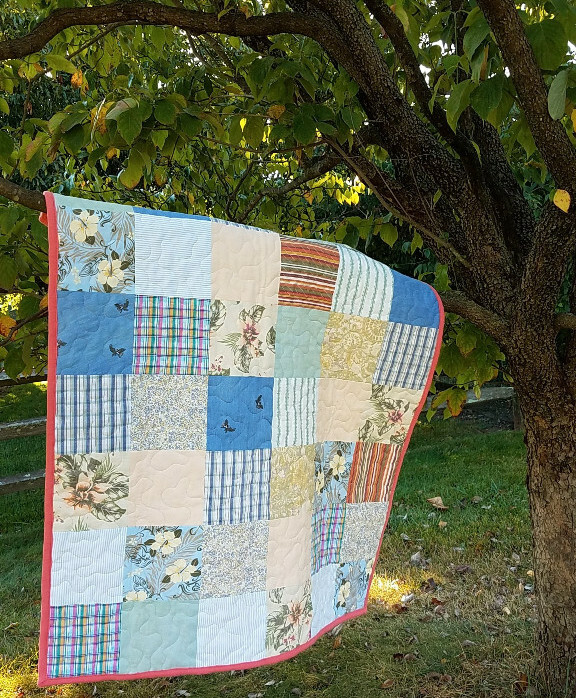 This quilt is extra special because it contains the grandmother's shirts. Sadly she is no longer with us. 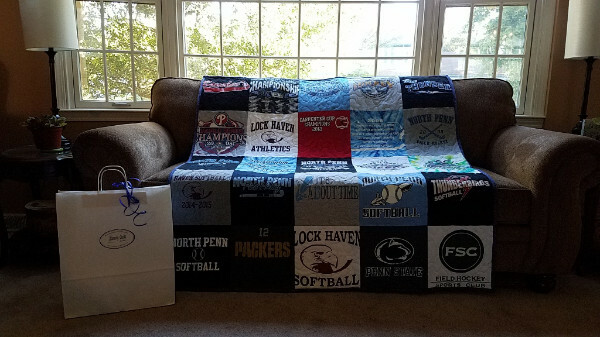 What a wonderful way to honor her with this baby shower gift that will become a family heirloom. 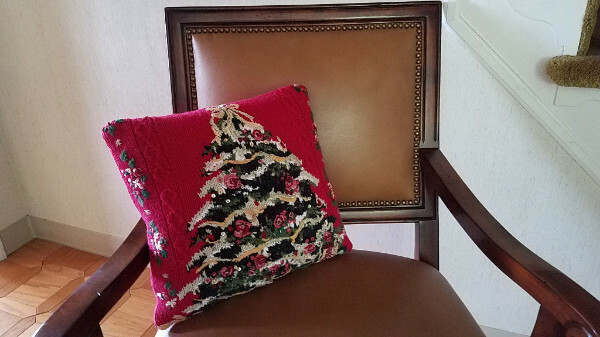 This 16" pillow was made in honor of a 95 year old grandmother. She wore this sweater every Christmas! What a lovely way to remember her. Yes folks, Buddy and MQBM are excited for Christmas! I have seventeen holiday quilts and seven holiday pillows on my schedule already! I will turn people away in November because I cannot guarantee holiday delivery. 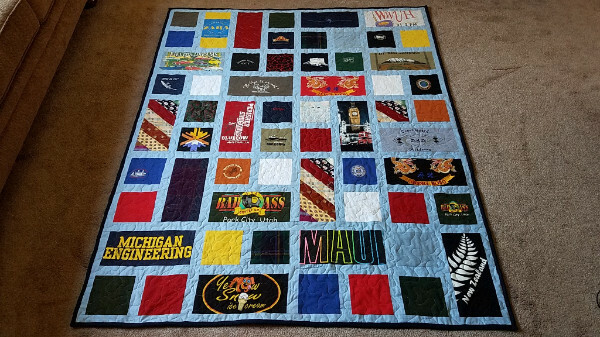 NOW is the time to order your custom handmade Memory Quilt for the holiday season!